As a whole I dislike making health claims on the blog. All too often I see “healthy and healthier” bandied about with no explanation of why the recipe is healthier. I have no formal training, but do have a keen interest in nutrition, and I hope that my biology degree gives me a reasonable grasp on the science. It is something that I would like to explore more, but until then I’ll stick with the principles of if you burn off more energy than you consume you will get smaller (and vice versa), variety and moderation are good, and eat lots of vegetables and fruit – I aim for an extra portion with every meal and eat good variety. Usually when I make a custard for ice cream I make it with a ratio of about 2:1 cream to milk. However on our recent trip to the Cotswolds we ran out of cream and to save Ed the 30min round trip to buy some more, I made the custard with milk and the last dribble of cream from the pot (about a 5:1 ratio). 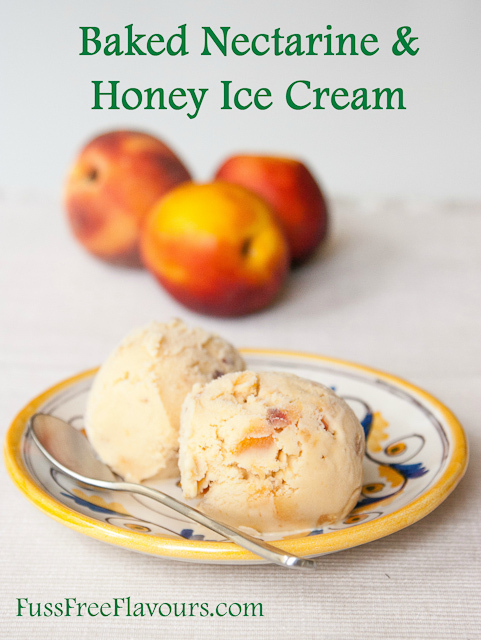 If you try this Honey Roasted Nectarine Ice Cream – Healthier than usual ice cream please tag #FussFreeFlavours on Instagram or Twitter. It is amazing for me when for me when you make one of my recipes and I really do love to see them. You can also share it on my Facebook page. Please pin this recipe to Pinterest too! Thanks for reading Fuss Free Flavours! 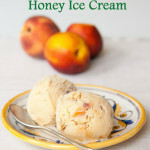 A delicious lighter ice cream - more akin to a gelato - flavoured with roasted nectarines. Makes about a litre. Arrange the nectarines cut side up in a single layer in an oven proof dish. Drizzle with the honey, and dot with the butter. Bake for 30 - 40 minutes, the time will vary according to ripeness, until soft. Remove from the oven and allow to cool. To make the custard by pouring the milk and cream into a medium pan and gently heat to a gentle simmer. Whilst the milk and cream mixture is heating mix the egg yolks and sugar with an electric mixer until pale and frothy. Carefully pour the hot milk and cream mixture over, whisking all the time. Return to the pan and cook over a low heat, stirring all over the time until the mixture has thickened and coats the back of a spoon. Set to one side and allow to cool. Use a blender to blitz half the nectarines and any cooking juices to a purée and add to the custard. Chop the remainder of the nectarines finely. Pour the custard mix into an ice cream machine and churn according to the manufacturer's instructions until frozen. Stir in the chopped nectarines, transfer to a plastic tub and freeze for a few hours until solid. You can vary the ratio of cream to milk, keep 450ml of liquid in total. Peaches would work as well as nectarines. Freeze leftover egg whites in silicon cup cake cases and use for meringue. Swirl some nectarine jam though to make this extra special.